Anne Alexandra Young Wilson was born in Bridgeton, Glasgow, Scotland in 1935. Youngest of six children her father, a lorry driver, taught her to play guitar. To earn some money at art school she performed on the local folk club circuit. One of her classmates was the singer and guitarist, Jimmie McGregor who introduced her to blues and hillbilly music. She eventually took the stage name Nancy Whiskey after the chorus of a well-known Scottish folk song called "The Calton Weaver." On recommendation from McGregor she was signed to the independent folk label, Topic. She moved with friends to London in 1955 and quickly established herself as solo folk singer but somewhat reluctantly agreed to join the Chas McDevitt Skiffle Group for a Radio Luxembourg talent contest. Nancy was a folk singer and preferred to work solo but her soprano voice blended perfectly with McDevitt's whistled obligato on Freight Train. The group re-recorded Freight Train and when it was released as a single it made the top five in the UK Singles Chart in 1957. The record sold over one million copies after which the group toured the US including an appearance on the high profile Ed Sullivan Show. Freight train entered the American charts which was most unusual for UK act at that time. A second single, “Greenback Dollar," also sold well reaching the Top Thirty Charts in the UK. 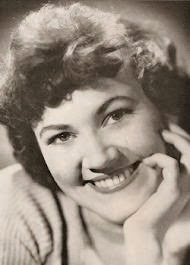 Unfortunately, the third single “Face in the Rain” failed to be a commercial success and Nancy left the band to follow a solo career but not before she records the album “The Intoxicating Miss Whiskey” with Chas McDevitt Skiffle Group in 1957.
br> When Nancy fell pregnant she married Bob Kelly (piano and drums) who became a member of her backing group, the Skifflers (aka the Teetotallers). Nancy continued to record and broadened her appeal with more generalised pop and jazz standards. She recorded He's Solid Gone album in 1958. Throughout the 60s the singer became a popular cabaret act but the 1970s, she had largely retired from the music industry. Occasionally she was encouraged to reprise her singing role, notably with Lonnie Donegan, at the Royal Albert Hall in March 1999. Nancy Whisky died in 2003.